You are either a coffee lover, or know a coffee lover in your life. And, what is better than coffee for that type of person? Why, consistent coffee deliveries via subscription, of course. Here is our list of the top 7 best coffee subscription boxes that any coffee lover would love to have. Bean Box is a craft coffee lover’s delight. Seattle is well known for its coffee scene, and Bean Box takes you on a monthly tour of their best coffees. You can pick your roast, and either choose a handful of 1.8oz artisan coffees, or a coffee of the month club that delivers a single 12oz bag. With their gift selection and chocolate pairing boxes, it is hard to go wrong. Peet’s Coffee is one of the first big names to come across as a craft coffee company. Their subscriptions offer both whole bean and k-cup options, and let you choose your flavors or explore, and even gives you options for your frequency of delivery. Chances are that you have tried Peet’s Coffee at some point, and chances are you thought they were just a commercial coffee supplier and didn’t think they had great subscription options. Give ’em a shot, especially if you are a k-cup user. Bookishly comes at you from a different angle entirely, pairing together fantastic books with your coffee subscription. If you are the type to spend your weekends relaxing behind a book with a coffee nearby, then this is the coffee subscription for you. They have various subscriptions, some containing classic or vintage books, and some even including Bookishly stationery for jotting down notes as you go. Blue Bottle is the newest and latest small batch coffee company to break out into the big leagues. Their stores are opening at a rapid pace, and are always packed with a line out the door. For those that want to skip the line, but still want to hold onto that unique Blue Bottle taste, their subscription has you covered. 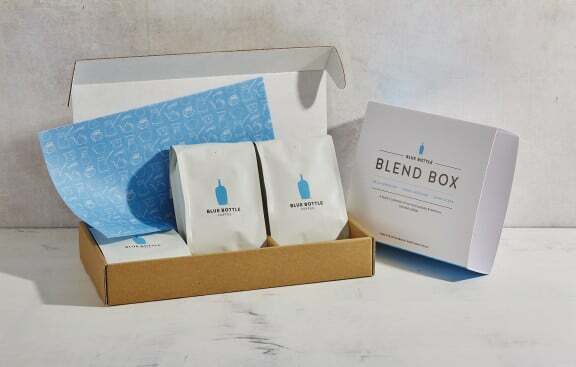 Blue Bottle has a range of subscription options, and even a coffee quiz to insure that you are picking the right subscription option for your palate. Match Made Coffee takes coffee subscriptions to another level of yummy, by pairing gourmet cookies with each of their craft coffees. Each month is a different coffee and cookie combination sure to please anyone’s inner coffee and cookie loving self. Affordably priced, Match Made Coffee keeps your tongue on its toes. I’ve had coffee subscriptions before, but I love the idea of including a paired cookie in the box – quite unique!